I have been trying to figure out what to put atop a large closet. It’s a textured wall, so options were limited. My inspiration came from this runner on my dining room table, and lots of empty toilet paper rolls people have been saving for me! All you need for this project is some toilet paper rolls, 3 paper towel rolls, white glue and paint if you want. I flattened the toilet paper and paper rolls first. It’s easier to cut them this way, and you can be more consistent. For the branches I used the paper towel roll because they are longer. I cut down the center of the roll. Then cut 1/4″ strips for the branches. To make the birds, I did the same with a couple toilet paper rolls. I then drew a pic of a bird, then I traced it on the paper towel roll. The paper towel roll is wider than toilet paper. After I made the bird shape, I added more to where the wing would be, to make it a little dimensional. To make the leaves, you use some toilet paper rolls. Flatten a bit and make small cuts, forming the leaves. Glue leaves together with white glue, then use a paper clip or clothespins to hold till dry. Hang with tiny clear pushpins, double sided tape, or glue on white paper or on rustic wood pieces. Don’t you just love the easy, fun crafts…especially when they are free! Super cute. Love your wall art! Thank you! It cost nothing…and was easy! 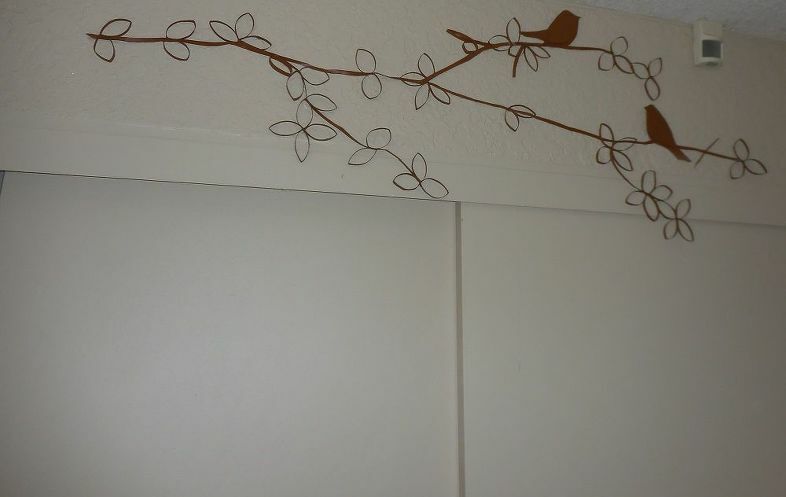 I love this – we have several spots where something like this would really make the room pop. Great idea! Thank you Rosemarie! I would love to see what you create when your finished. Easy and Free!!! I love these kinds of crafts that are so easy. I love it, so pretty and easy, you know I love easy. I do too Pat, and…..the best part is it’s free. I just love these kind of projects. Easy so everyone can try. TP rolls are free, so if you make a mistake (which is highly unlikely) no money is out of the pocket. i actually did that project a couple of years ago. It was fun….and so easy! Best of all FREE!! !